Fire pits and chimineas are welcome additions to most outdoor spaces, infusing the area with style, charm and warmth. A fire pit can easily transform a backyard or patio from a dull, inhospitable space to the social center of your home. Since the fire pit will likely become the focal point of your patio, you will want to pick out a piece that fits your aesthetic and personality. Look for a piece of functional art that fits properly in the space allotted and stays within your budget. The good news is, you can obtain a beautiful, high quality piece for an amazingly low price. The following are five outdoor patio fire pits and chimineas that our team are particularly excited about this holiday season. The Fleur de Lis fire pit by Fire Pit Art is a favorite because it proudly showcases the French symbol that often signifies perfection, light, and life. This high quality, hand crafted fire pit is also one of the most unique fire pits on the market. Each one is individually signed by the designer, Rick Wittrig, and is made from thick carbon steel. The Full Moon Party Fire Doom is another favorite because it is affordable, unique and durable. This top of the line patio fire pit was designed in the USA and created with the finest materials possible, including powder-coated steel. The design is so exquisite. If you are looking for a fire pit that will turn heads and keep visitors talking, this is unquestionably the choice for you. If you prefer a gas powered fire pit for your patio, the Azteca fire pit is a great option. The Azteca fire pit has the same textured look as clay, but the FirEx composition makes it more durable. Another plus is that the flame can be adjusted from 20,000 to 32,000 btu depending on your needs. Chimineas are very similar to fire pits in the fact that they add physical and design warmth to your outdoor space, however chimineas often have a more rustic look. The Grape Style Chiminea is the most popular outdoor fireplace because it is affordable, well made and functional. We love the Grape Style Chiminea for its detailed grape leaf design and cast iron grill insert. If you are going for a more modern look in your backyard or patio, you will love the tidal fire pit. 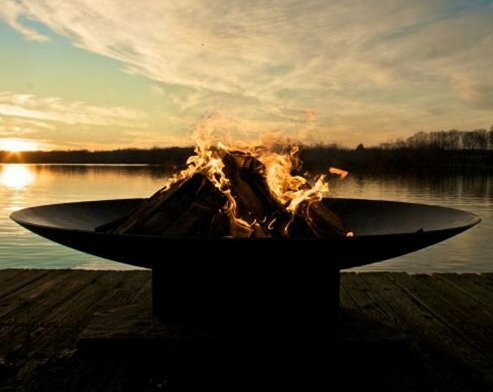 Each tidal fire pit is made from one quarter inch carbon steel, the heaviest gauge metal used in any fire pit. Similar to the Fleur de Lis Fire Pit, it is also hand crafted by Rick Wittrig for his Fire Pit Art brand. The 1-1/2 rain drain in the bottom of the tidal fire pit is another highly functional feature that we appreciate. Adding a fire pit to your outdoor space allows your family and friends to come together in a relaxed setting, making better use of your backyard or patio even in the chillier months of the year. Don’t be surprised if they keep coming back to enjoy the cozy and relaxed ambiance created by the warm glow of a new fire pit. About the Author: Derrick Riley is a Managing Partner at Patio Products USA, a subsidiary of Neighbors Marketing specializing in patio products and accessories for the home and commercial use. Patio Products USA is one North America’s largest distributors of products to improve outdoor entertaining, including a wide selection of outdoor patio furniture covers, patio fire pits, and garden patio heaters.